My poor sister has been down with a sore throat that turned into a cough for a few weeks now, and my mother has been riding her to get to the doctor for an antibiotic. My mother warns me, “Stay away from your sister because she’s contagious until she takes the antibiotic.” My mother is not particularly ignorant. At age 88, she still reads thick political treatises that I can’t wade through, but when it comes to health she buys the party line. Like so many others, she doesn’t have a clue about how to handle the flu. In fact, it seems that most people don’t even really know what the flu is. Everywhere I turn these days, people are succumbing to a plethora of symptoms, with some describing their maladies as “bad colds,” others saying they have bronchitis or a virus, or the flu. We are, in fact, solidly into flu season— according to the latest report, the flu is now rampant in 36 states in the US—and some of the sick really do have influenza.1 But it’s famously difficult to differentiate flu from other respiratory illnesses, and so, many end up treating the wrong sickness with the wrong strategy. Here are some things you should know about the flu to help you make wise decisions about prevention and treatment. This year, the efficacy of the vaccine is almost at the level of a joke. It works against only 10 percent of flu strains currently active, meaning it has a 90 percent failure rate. To complicate matters further, it seems that this year’s vaccine isn’t even working well against the viruses correctly identified, because a problem in the vaccine’s production has been weakening one of the three targeted strains so that it fails to trigger the expected immune response. Perhaps if you failed math class you’ll buy that logic. On the other hand, as Jon Barron points out in his most recent newsletter, even if the vaccine doesn’t protect you from getting the flu, studies indicate it may help lessen symptoms if you do come down with it, and so it might be worth getting, according to your particular situation. Just don’t get the vaccine believing it provides ironclad protection against the flu, and remain aware of the risks and potential side effects. Again, read Jon’s newsletter for more information. 2. The Flu is Not Pneumonia, Nor Bronchitis, Nor a Head Cold. Although the flu and common colds share many respiratory symptoms, influenza tends to come on fast and furious, bringing temperatures over 100 degrees and miserable body aches, whereas colds rarely have associated high fevers and tend to be more about runny or stuffy noses and sneezing.3 Likewise, the flu can weaken you so that you become more susceptible to serious respiratory illnesses like pneumonia or bronchitis, and in fact, that’s a fairly common occurrence, particularly when the immune system isn’t in top shape to start with. But the flu is strictly a viral disease, meaning antibiotics are completely useless in combatting it. What they may protect you from is the opportunistic pneumonia we just talked about, which is primarily caused by the bacteria Streptococcus pneumoniae. The only way to know for sure if you have some form of flu, rather than a cold or pneumonia, is to get a swab test. Ask your doctor to do the test if you aren’t sure what’s up with you. Experts say that if your cough or thick discharge lasts longer than a week or two, you’d better get to the doctor because you’ve probably developed a bacterial infection, and that’s where antibiotics may be of use. If it is, in fact, the flu and you get it diagnosed the first few days, the doctor might want you to take Tamiflu to lessen the symptoms. Then again, that too may be less effective than advertised. 3. Your Best Defense is Avoiding Exposure. It might seem obvious, but you won’t get the flu if you’re not exposed to the germ. Of course, with the flu virus now infesting 36 states and spreading, your chances of exposure are excellent unless you stay inside with the shades drawn. But on the other hand, you can be a bit cautious. In other words, don’t go visiting friends and relatives who are bored and restless after being isolated with illness for days on end, who feed you the proverbial line, “I’m not contagious any longer.” Or, “it’s only a head cold.” If you hear them coughing on the other end of the phone, you might be wise to take a rain check. In fact, the flu is contagious the entire time symptoms are still present.4 It’s a myth that after a few days, it’s safe to be around someone who had a 101-degree fever just two days earlier and who still has a sore throat, or “just” body aches now. That’s why it’s so horrifying that people return to work as soon as the fever passes, coughing through meetings, that clinics issue “excuse notes” that only cover 48 hours given that the typical flu can last 10 days, and that people stroll down supermarket aisles and crowd into airplane seats “at the tail end” of their illness, still contagious. You can’t do much about the sick folks in public places, but you can say no to a full evening with your sick pals. 4. Your Second-Best Defense is Bolstering Your Immune System. As Jon points out in his newsletter, it’s wise to use a natural immune-enhancing formula during flu season to keep your immune system at peak efficiency. Also, do remember to wash your hands thoroughly with soap and water after shaking hands, receiving money, touching keyboards or gym equipment or anything else that’s shared with potentially infected people. And most of all, don’t weaken your immune system by binging on sweets and treats and indulging in other unhealthy behaviors. Tis the season to be prudent. 5. Your Final Defense is to Attack Those Pathogens. 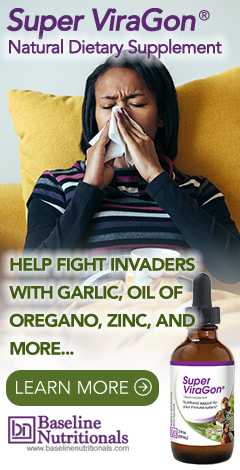 Taking an anti-pathogenic formula heavy on garlic, ginger, olive leaf, liquid zinc, oil of oregano and other natural germ-killers when you get sick can make the difference between ending up in the hospital versus just feeling miserable for a few days. In fact, such a formula can sometimes ward off the illness completely, if you catch it during the incubation phase when symptoms are first starting to appear. the flu is a virus and a virus dies in HEAT - such as a fever or put on a cap, socks, warm underwear, a heating blanket and drink hot chicken soup and STAY in bed for 2 days and sweat sweat sweat !!!! Ask my grandma - that's how she did it !!! Pls show this comment publicly !!! I got the flu from the nursing home I work at. Started taking SuperViragone every 4 hours and put myself to bed wearing multiple layers of clothes under heavy covers. I made sure my temp went up to 103 and I burned off the virus. Viruses are very fragile and have a narrow window of viability as per temperature. They like it a little cooler than your normal body temperature and can't replicate in high temperatures. This I learned in Nursing school. Took about 48 hours until the fever broke and all the body aches were gone. Bringing down your fever with medicine shackles your bodies defenses from getting rid of the invader. Why would you want to do that? That is the first thing MDs tell you to do. Also, funny how the flu epidemic started with those that got the flu shot at the nursing home I work at.